A delicious and simple to make payasam (kheer) with varagu (kodo millet) and moong dal. Image is for illustration only and not that of the actual recipe. 1. Combine the varagu and moong dal. 2. Pour 4 cups of water and pressure cook for 1 or 2 whistles or until cooked. 3. Add enough water to jaggery and stir until fully dissolved. 5. Add this to the cooked varagu-dal mixture. 7. Fry the cashew nuts and raisins in little ghee. 8. Add elam, sukku podi and stir well. 9. Add this to the varagu and dal mixture. 10. Add the coconut milk and mix well. 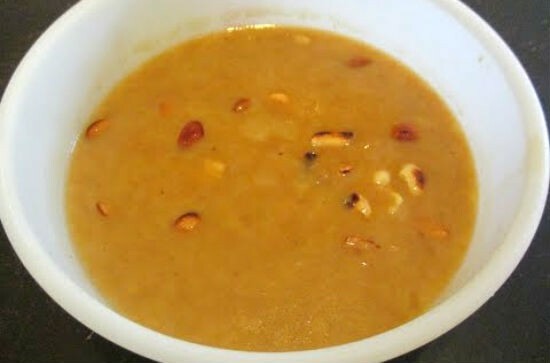 Feel free to comment or share your thoughts on this Varagu Pasi Paruppu Payasam Recipe from Awesome Cuisine.